See that? In the window? See that Amish head? Total accident. I actually took four shots of this parked buggy, and in the last one I got a little happy surprise. I didn't want to actually try to take a picture of an Amish person because one of the premises of my book is treating Amish people like normal people and not circus freaks, and while the urge to snap is very strong when faced with the strangely bearded, I resisted and, in my opinion, was given a little present for my moral fortitude. After we purchased our plane tickets for my grandmother's memorial service, I posted something about our trip East on Facebook. My editor then asked if we were headed to Amish country...and it got me to thinking. 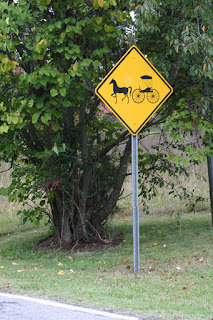 Were there Amish in North Carolina? I knew Grandma wouldn't mind. 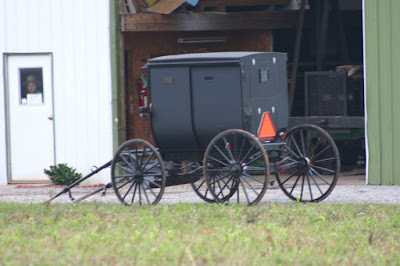 She would have rolled her eyes and drawled, "Honey, if you need to go see the Amish, go see the Amish." And that would have been that. The last two shots are brough to you by my cousin Melissa, seeing as how I shot a slew of photos without my memory card inside my camera. I have grieved the loss and moved on, although the shot I'm saddest about loosing is the black kitten walking through an Amish-carved spindle-thingy. Anyway, we stopped at the Shiloh General Store, where we ate Amish ice cream (good stuff), bought fudge and Strawberry-Rhubarb butter. The store was run by an Amishman; a young lady served us the ice cream. We chatted with the older gentleman for a little while - once he found out we were from Oregon, he asked if we'd ever been to Sisters. Aparently there's a farming periodical that's published out of Sisters, and it was the only connection he had with Oregon. 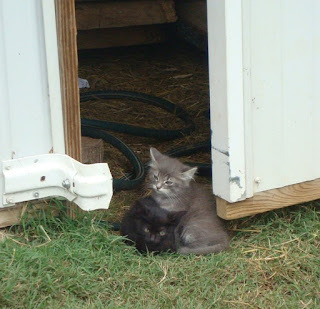 He also told us about his son-in-law who ran a woodshop down the street, so we hiked down a bit - that's where we found the kittens. All in all, a great trip. I didn't work up the nerve to ask anyone any questions, although in hindsight there were several things I could have asked and sounded intelligent about. I mean, it's not like I haven't researched these people for the last several months. 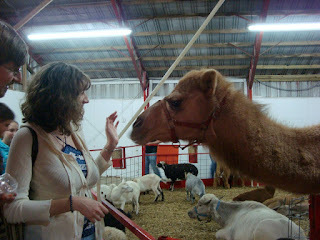 Also fed it a carrot round and nearly lost a finger (more user error than camel violence).